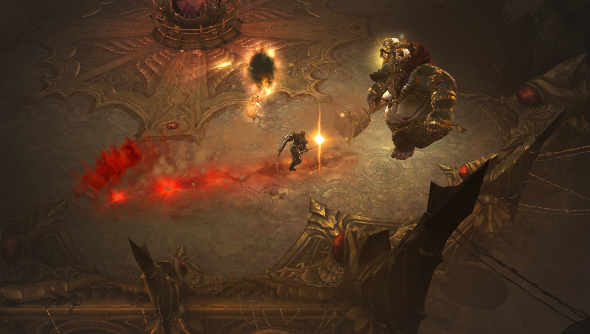 Diablo III’s craven, scurrying Treasure Goblins are enigmatic wee beasties. They appear, with their sacks of loot, and are quick to disappear through portals if they aren’t killed and their wealth stolen. Where do they go when they leap through those portals? Is there a land filled with goblins and gold on the other side? Patch 2.1.0 finally reveals what is through the portal: the Vault. When a Treasure Goblin is slain, a portal will appear which will give adventurers access to a realm of unimaginable wealth, all pilfered by these shifty little monsters. “The inspiration for the Vault was a mixture of a couple of things: a bee hive, the Lord of the Rings, and Scrooge McDuck’s infamous Money Pit,” said lead environment artist Richie Marella. Different goblins populate the realm, from little worker goblins and violent goblin guards to the ruler of the Vault: Baroness Greed. And, of course, adventurers will need to fight through them to get all the lovely loot. Patch 2.1.0 is getting put through its paces in the Public Test Server at the moment.